Jesse Rone has started a fun new challenge - Forgotten Stamp Friday - where we are to dust off old stamps and ink them up...stamps that we haven't used in at least 6 months. I pulled out this Verve set that was released beginning of 2010 and I don't recall inking this sentiment since then. I used Amber's Viva la Verve sketch challenge on the Verve forum on SCS for the layout. I had a wonderful day of shopping with girlfriends in Fredericksburg and our fave stop of the day was Scrapdoodles! 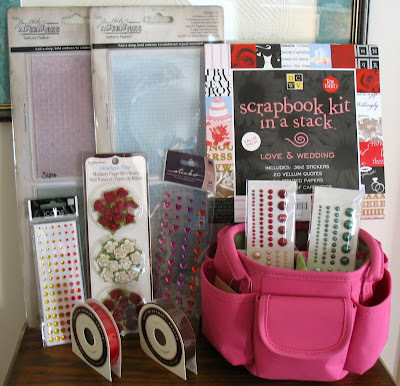 This was heaven on earth for stampers and scrapbookers...sooo many different supplies that it boggled our minds! 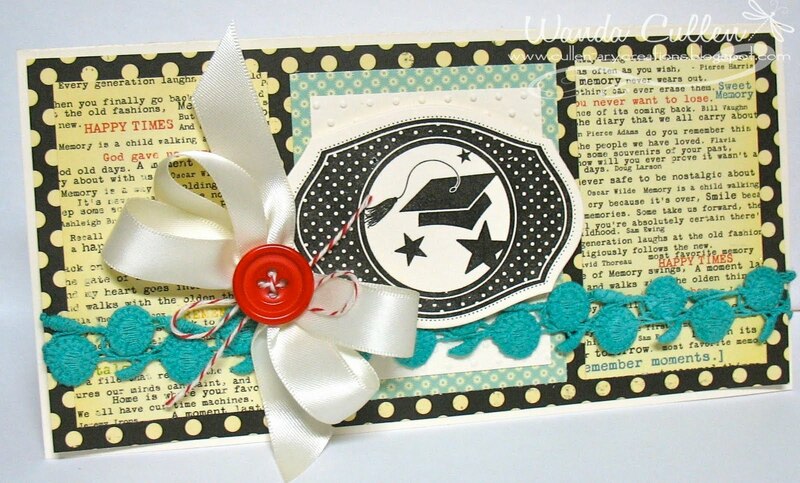 The ribbon and lace used on this card was from this store. 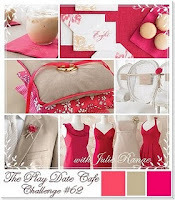 This is my first time playing in the Play Date Cafe Challenge, but was intrigued by their colors and inspiration picture for the last challenge of 2010. The S.S. room is painted and all went well without any major glitches...BUT...there will need to be some touch up work done. You get a group of young girls together and their minds will stray to topics other than concentration on painting. :-) Kim's Way to Use It Challenge on SCS was to use silver in our cards/projects. I embossed in silver, layered on silver metallic CS and added silver pearls. 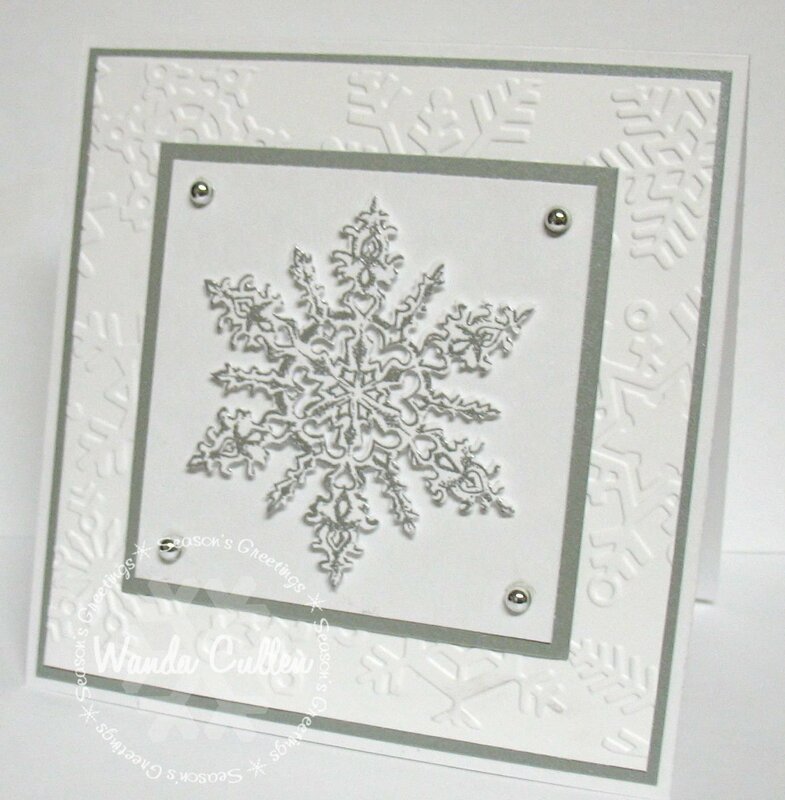 The BG was embossed using a 5x7 inch snowflake CB EF. I'll put this away for next year's holiday card stash. The Waltzingmouse Sketch Challenge was simple and unique this week. I used DP from MFT and stitched along the edges of the triangle. 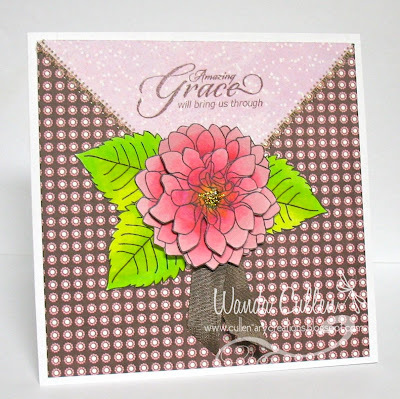 The dahlia was stamped twice and colored with Copics, then a portion was cut out and layered with foam dots. Some diamond stickles were added to the center. A little seam binding was the finishing touch...simple yet it makes a bold statement. I have a project organized with a local Girl Scout troop helping me paint the youth S.S. room at church this morning. 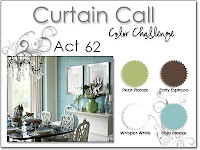 Here's hoping we get more turquoise paint on the walls than on ourselves - lol! 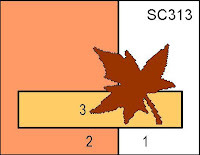 It's party time for the Wednesday Challenge Club on MFT's SCS forum and we were challenged to make our best party card. 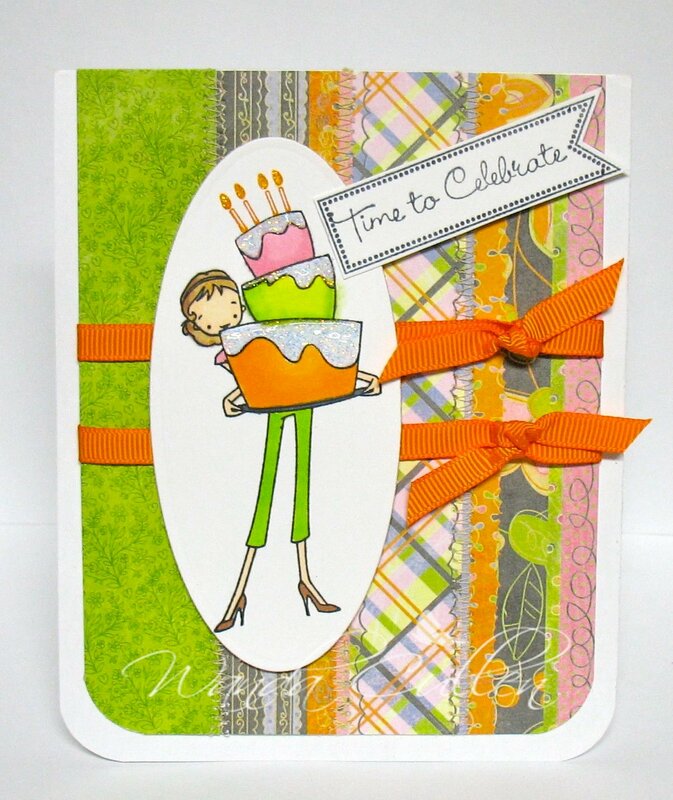 This a la mode image from MFT is so fun to color and to add stickles to the candle flames and the icing! I loved that the sentiment fit into Lil Inker Design's sentiment flag stamp. 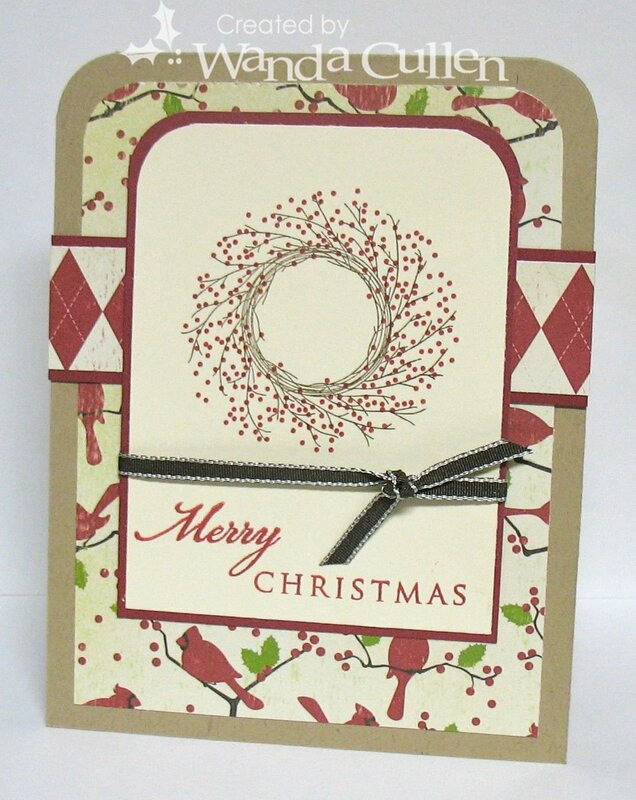 Some grosgrain ribbon and some zigzagging stitches on the DP and this was a fairly quick card to put together. In case you haven't heard, I'm giving away blog candy in a couple of weeks...check out the details on THIS POST. Just a reminder to check MY POST HERE for a chance to win some blog candy...have a great day...and just remember you're not fully dressed unless you're wearing a smile! :-) This quote always ends a music program on the radio that we listen to on Sunday morning. The sun is out and it's to be warmer the rest of the week, so it's much easier for me to smile. The flower base was die cut from kraft felt; the next layer was stamped and hand cut from olive CS. 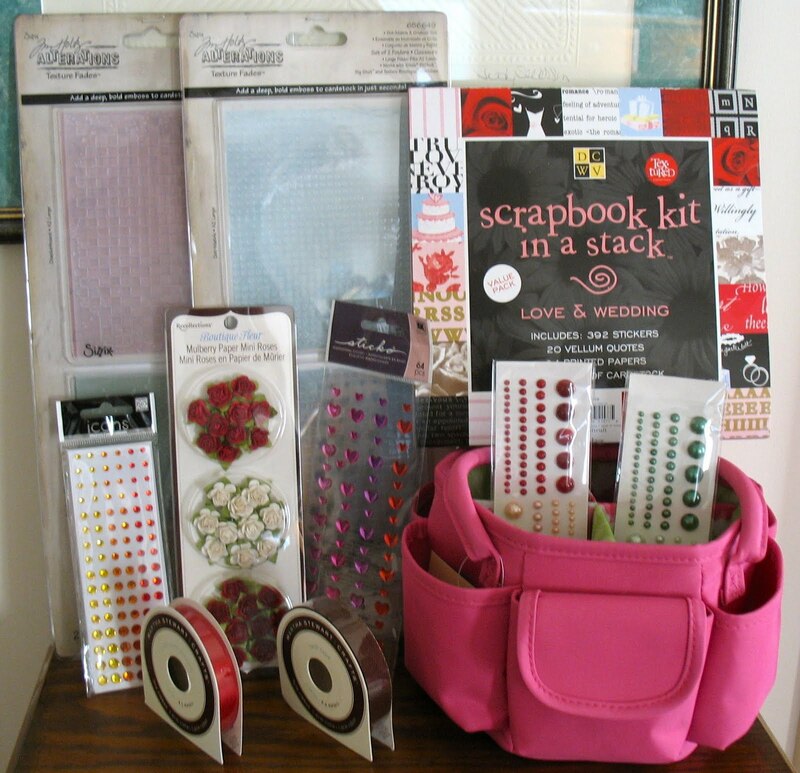 Don't forget to comment HERE for a chance at some blog candy! Leave a comment on this post AND you will need to be a follower. 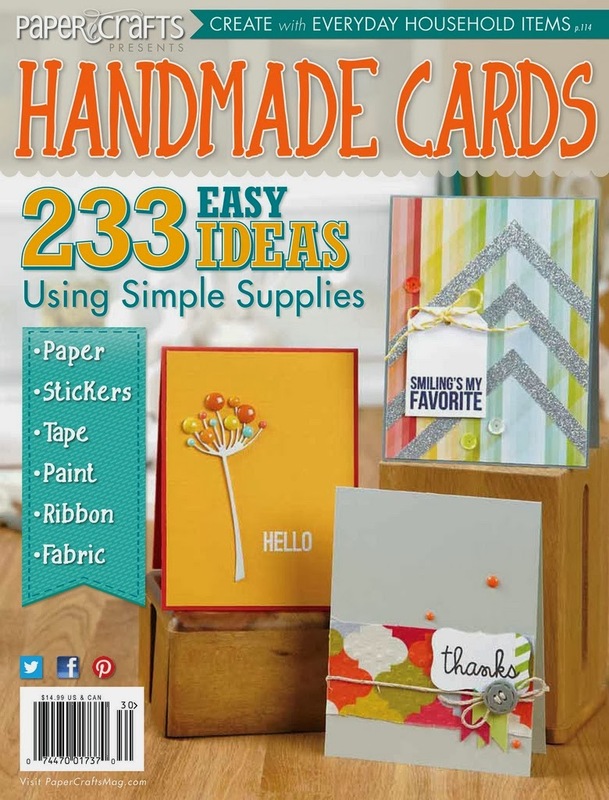 I'd love to hear what your new year's goal is with papercrafting. My goal is to give my older stamps some ink at least weekly. 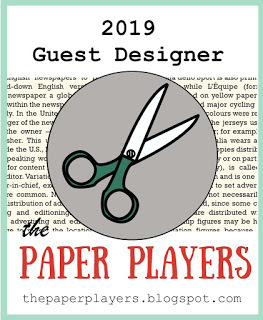 Deadline will be noon on January 12. Winner to be announced that day (pray I don't forget - lol). Good luck to all of you and thanks for your support! 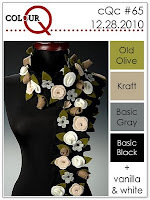 Mary Marsh has a great Color Challenge on SCS: Old Olive, Night of Navy & Daffodil Delight with a dessert option to use buttons or brads. 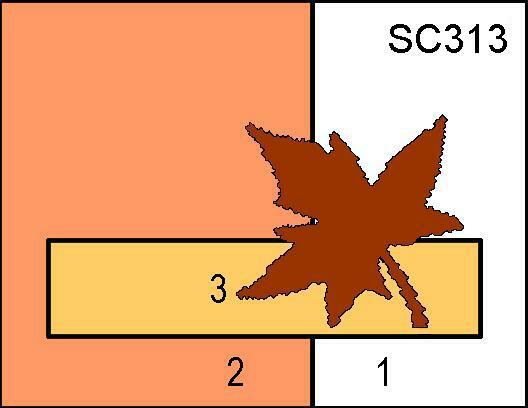 I kept it CAS and ran the top portion through the CB using the square lattice EF from SU. 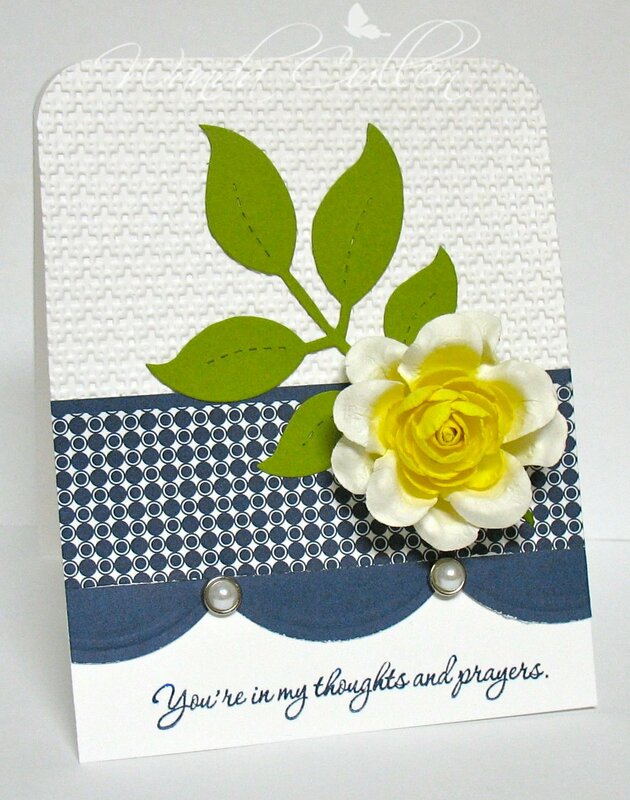 I used a large scallop punch by EK Success on the navy border and pearl brads were added. 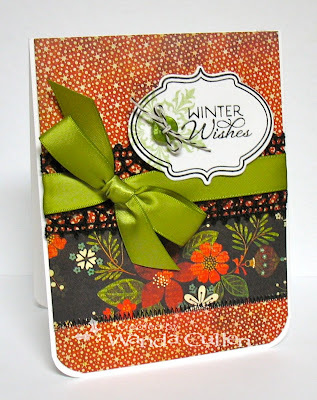 The leaves are a Sizzix die cut from Old Olive CS and the prima is by Prima Marketing, Inc. The sentiment is from Verve's Meditations set. I'm still loving my corner chomper, so had to round it off before I could call it finished! Thanks for looking and commenting! Teresa has an awesome sketch for the last Viva la Verve Challengethis month on the Verve forum! I was inspired by some red and green striped candy canes that I had leftover from Christmas...thus the choice of the striped DP. There are a couple of people I didn't get Christmas cards sent to, so will send them winter wishes instead. It's a cold and blustery day in VA...hope you're keeping warm in your neck of the woods! 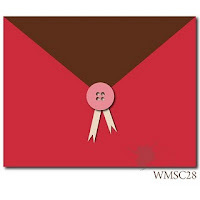 This is the last Mojo Monday Challenge for 2010 and we had the choice to do round or square. I love circle cards, but they make me crazy to put them together, so I chose the easier option of a square. 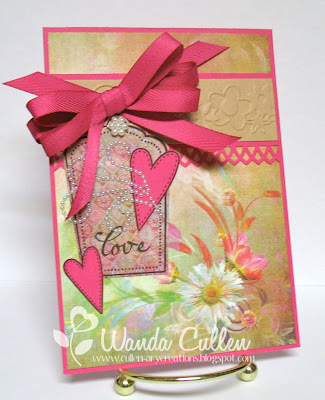 Using more of the Fine and Dandy Tickled Pink DP by My Mind's Eye for the BG, I stamped the small text with Bermuda Bay and matted it on Hawaiian Shores CS (PTI). 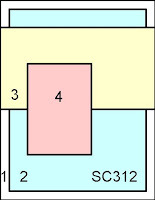 The ship was paper-pieced using the same MME DP. 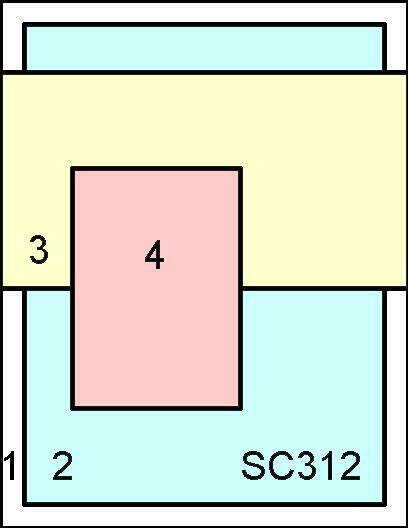 The card is 5 1/4 inch square, but if I did it again, I would scale the card to a smaller square to be more in proportion to the ship size. It was big enough, however, to add a big honking bow - lol! 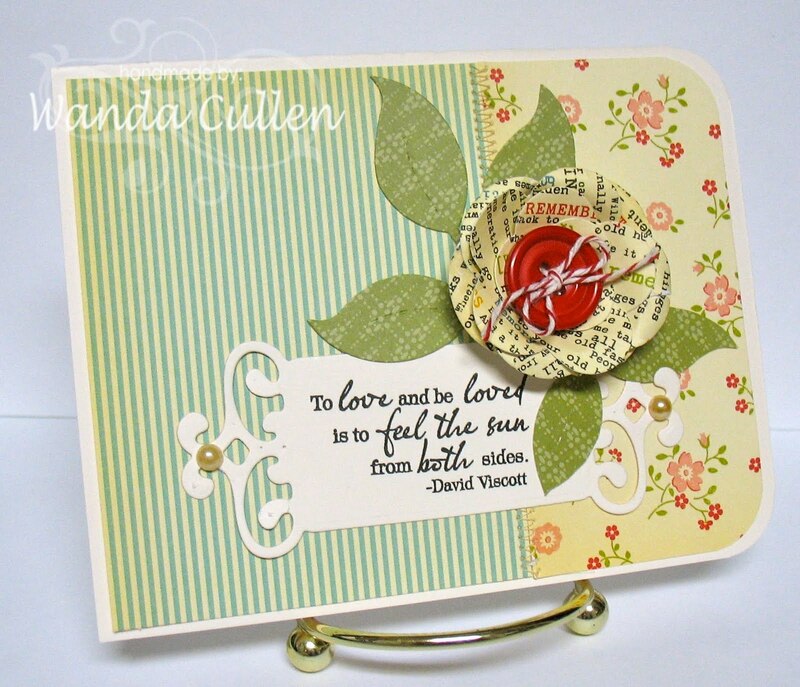 Stamps are from a new Verve set called Text Objects which I love! Julee is having a Good Buy Sale in the Verve store with percentages off everything PLUS an additional 10% off through the end of the year. Check it out! ...and all through the house...the stamp room was stirring once again after a wonderful couple of days with family and friends! Just so thankful the snow storm went on by us and only dumped a couple of inches. Relatives on the east coast weren't so fortunate! 18 inches in Chesapeake...more than my DH's cousin could ever remember seeing in that area! LeisaJane is the featured stamper on SCS and I cased this card of hers. 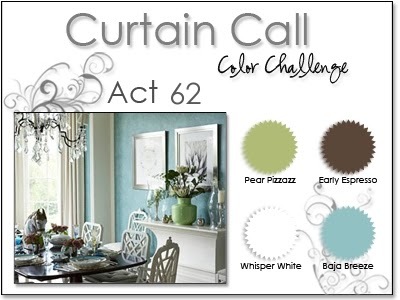 This card is also for Stacey's Curtain Call Color Challenge to use Pear Pizzazz, Early Espresso, Baja Breeze and White. 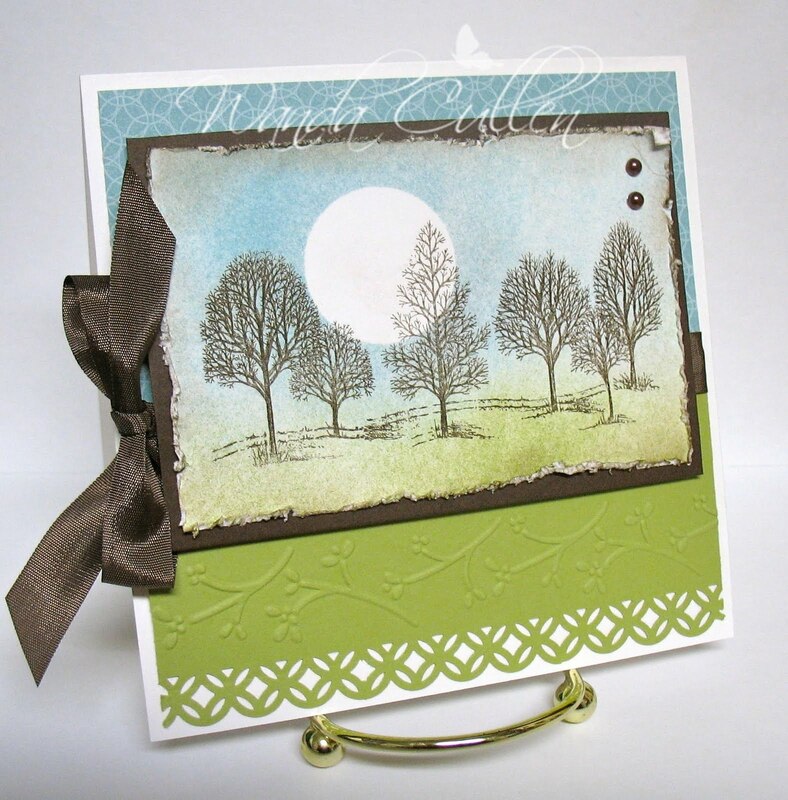 I sponged the skies with Baja Breeze ink and sponged the grass with Pear Pizzazz ink. The edges were distressed and sponged with Early Espresso. This is one those generic cards I like to keep in my stash to add a sentiment later as needed. 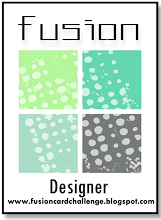 -On a totally different note...I'm passionate about stamping - lol! -"You're not even going the speed limit!" -"Don't sweat the small stuff!" -"It takes time...Rome wasn't built in a day!" -We can't always choose our circumstances, but we do have a choice in how we react to them! -If we feel distanced from God...it's certainly not Him who has moved! -God doesn't give us more than we can handle. -What goes around, comes around! -I'm happy to travel anywhere I've never been before and that would be a LOT of places! -they say being cold speeds up your metabolism, so I would like to think it's a great season for weight loss - lol! 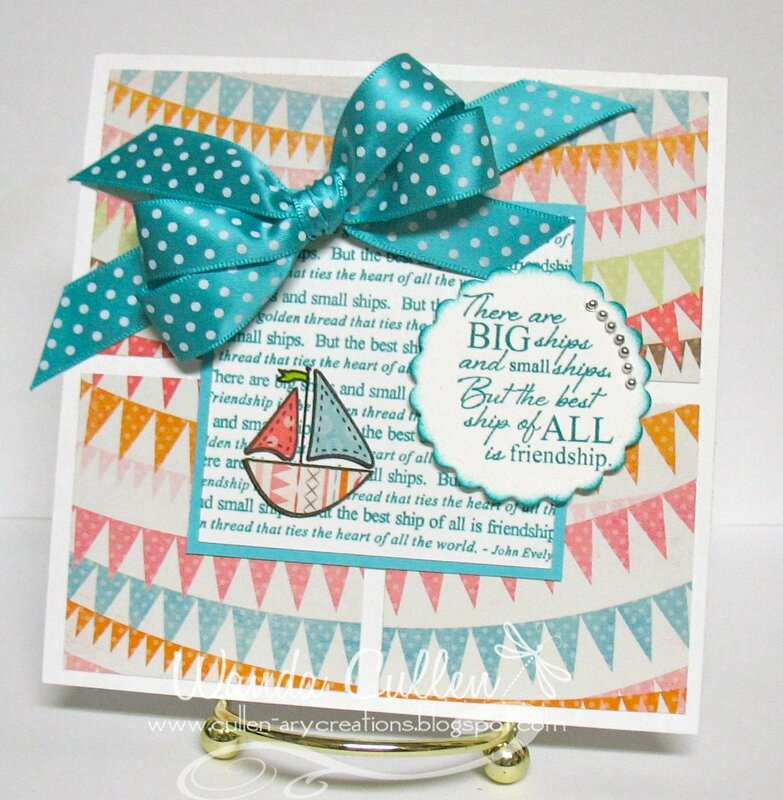 I've been a little down with my stamping mojo recently, but got a pleasant surprise when I discovered I was 1 of 2 who won the Belle of the Belli award for the last bi-weekly challenge! I really needed that perk, so thank you to the DT for this affirmation! 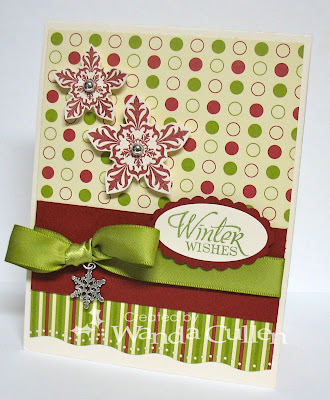 Their new Belli Challenge (and the last one for the year) is to do a Christmas themed card. I got a beautiful card in the mail today from Teresa Kline and wanted to CASE it (see the smaller blue/brown card picture). By adding a line of stitching, this card also qualifies for SCS Technique Lovers Challenge to use sewing - real or faux. OK...so I'm going to try and justify why I'm stamping and NOT doing more cleaning or baking for Christmas. Yesterday, I tackled both bathrooms and the bedroom and by last night, I was exhausted! My kitchen floor still needs to be cleaned and the frig needs cleaning...but that's what afternoons are for - lol! 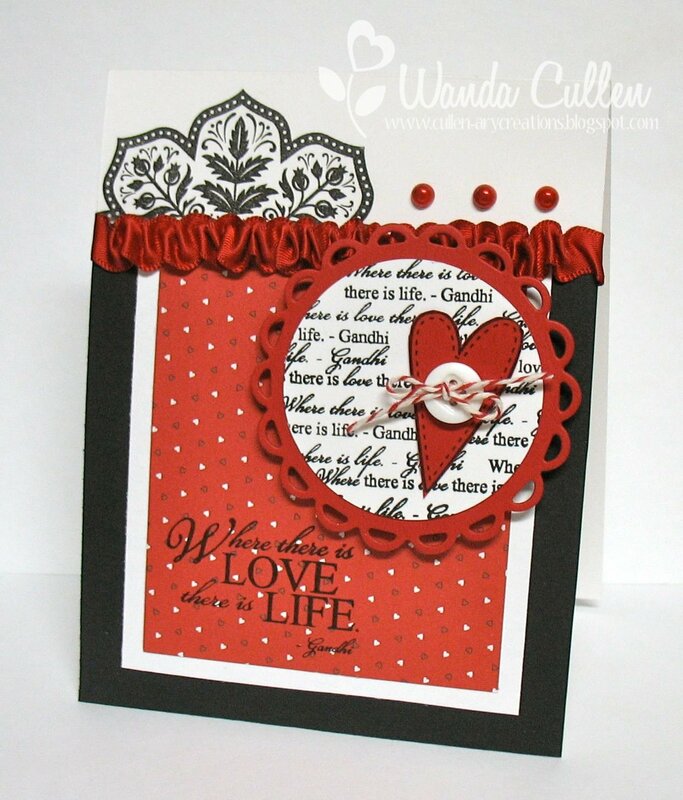 I couldn't resist MFT's Wednesday Stamp Club challenge which is all about Die-namics. 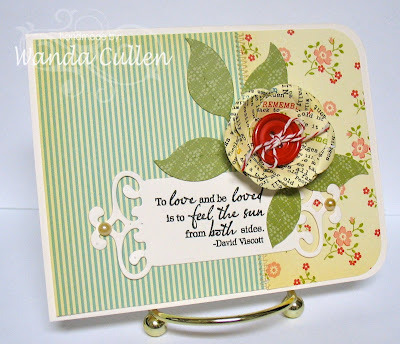 We were to make a card using any of their dies for a chance to win a $15 gift card to the MFT Boutique! 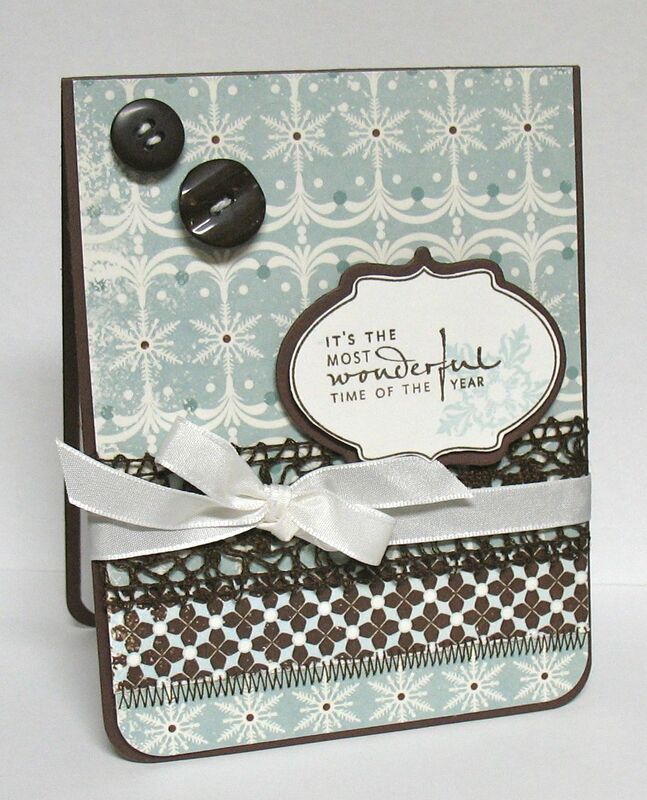 I just got into this company's products this year and am loving their dies and stamps. 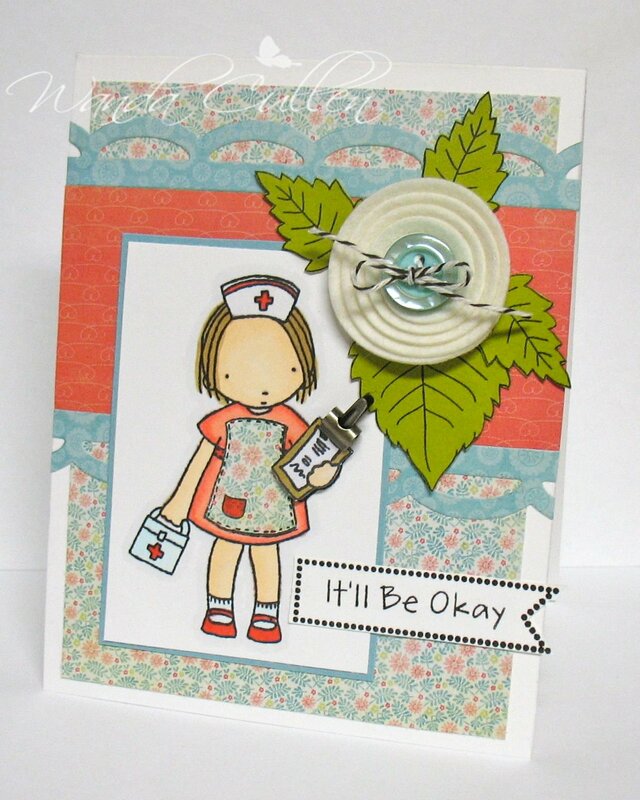 I started out by getting this Pure Innocence nurse set and she's still my fave! 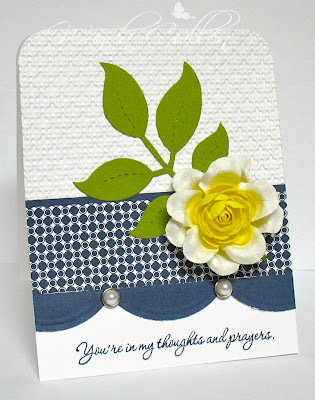 I used their open scallop border die and the rolled flower die (cut on felt). 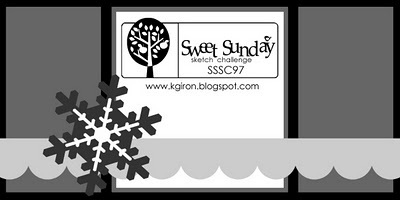 Roxie had a simple Sketch Challenge on SCS, so I went with that for the layout. I paper-pieced the chart (raised it on foam dots so I could use this mini clip) and spron and colored the remaining image with Copics. 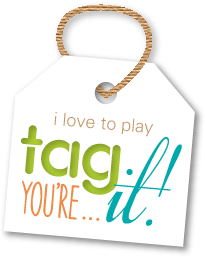 Enough play time...now on with some serious checking off on my 'to do' list. 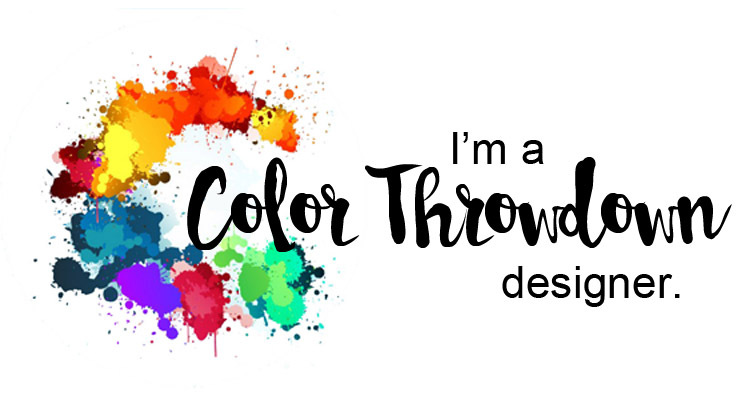 Hope your week is going well...I always enjoy hearing what you think about my creations! STAMPS: Best Medicine (Pure Innocence by MFT), My Umbrella (Pure Innocence by MFT) - sentiment only, Sentiment Flags by Lil Inker Designs, Delightful Dahlias by PTI - leaves. Classy colors (Basic Black, Real Red, White) for the SCS Color Challenge - thanks, Joanne! 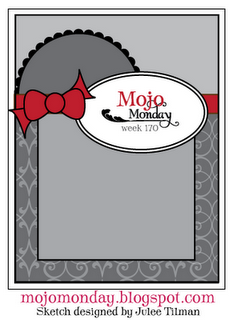 I used Julee's Mojo Monday Sketch Challenge for the layout. 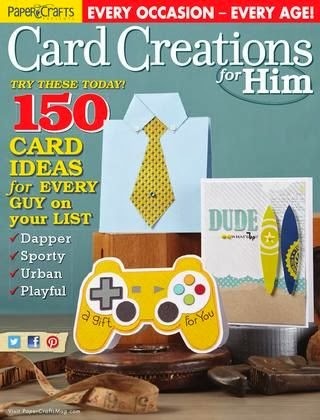 I think the card is self-explanatory with no special techniques used. 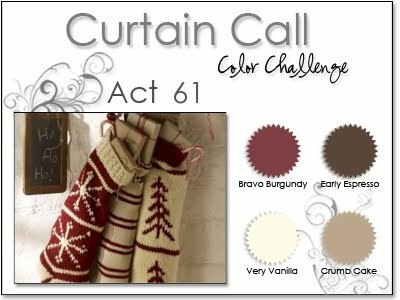 Stacey has some fabulous colors in the Curtain Call Color Challenge this week: Bravo Burgundy, Early Espresso, Crumb Cake, Very Vanilla! I stamped the wreath in Early Espresso then stamped the berries & sentiment in burgundy. A quick espresso ribbon and chomped corners and this CAS card was completed. 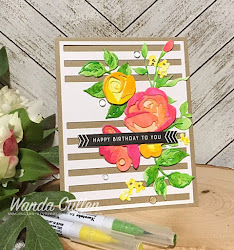 Karen Giron's Sweet Sunday Sketch Challenge was perfect for me to create a graduation card for my middle son's girlfriend who graduated from James Madison University yesterday! The long size will be perfect to insert a green bill...let's see...whose head should we pick to line the inside? LOL! The sentiment on the inside says 'Wishing You Success and Dreams Come True'. Again, I went to my current fave DP by October Afternoon called Thrift Shop Pad. I used Versafine Onyx Black to stamp the image...great ink that gives me really good coverage when I stamp! The trim is new from Webster's Pages (can be found at Stamper's Dream store)...fun for a different textured border! Thanks for stopping by and commenting...keep your eyes open for some upcoming blog candy as I get ready to celebrate my 1st blogaversary in January!